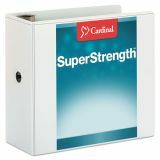 Cardinal SuperStrength ClearVue Locking 3-Ring View Binder, 5" Capacity, Slant-D Ring, White - Presentation binder offers extra-strong, nonglare vinyl overlays for easy graphics display on the front, spine and back. The Slant-D locking ring mechanism offers added security for your letter-size documents. Extra-firm locking mechanism prevents spills, eliminates all gaps and is easy to grasp with the oversized trigger. 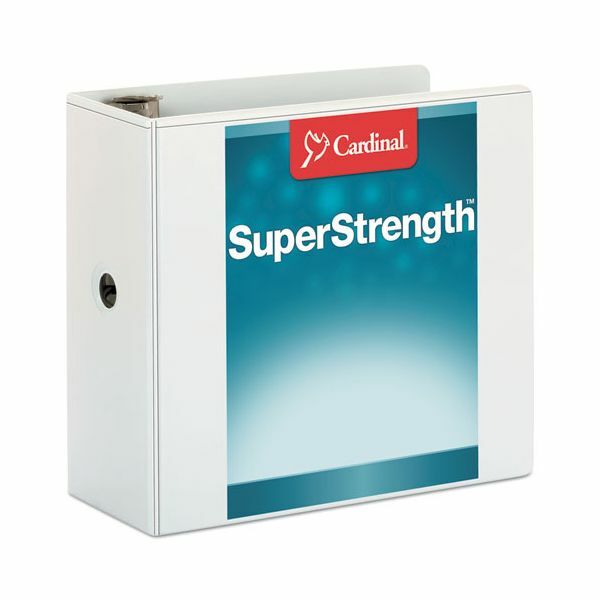 SuperStrength Slant-D rings hold 25 percent more than standard-size round rings. 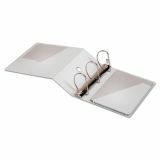 Back-mounted steel rings reduce wear and allow pages to lie flat. Capacity is 5. Patented Expand-A-Pocket expands to secure up to 1/2" of material. Interior DataGuard pocket protects your documents from ring impressions. 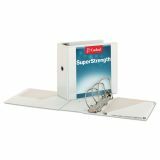 Binder also features a sturdy chipboard core, exposed rivets and a front inside pocket that holds 40 sheets.